Every time we go to the beach, my daughter collects tons of seashells that we tote home and never do anything with. Earlier this month, my little peanut turned 16, and we went to the beach to celebrate... only to come home with another big bag of shells. But this time, I vowed I would do something special with the shells from this trip...a memento of her big Sweet 16 birthday! I've had this glass bottle in my pantry for quite some time. It's an old milk bottle that I've been saving for something special. It's such a pretty shape and size, and a great way of displaying some smaller treasures, like my daughter's shells. All it needed was a quick wash and dry, and it was ready to be filled. 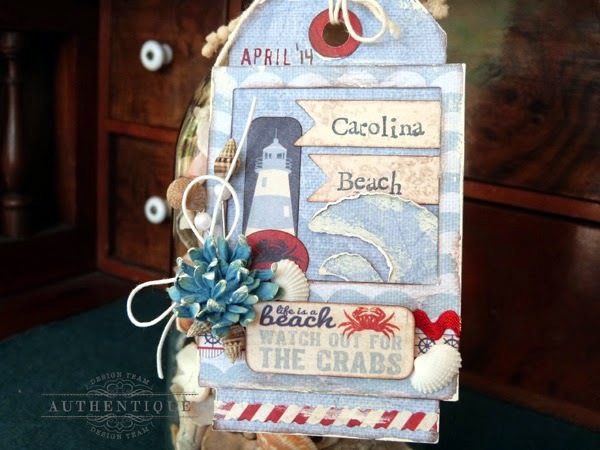 I made a fun beach tag using Authentique's adorable nautical collection, Anchored, to hang around the neck of the bottle. 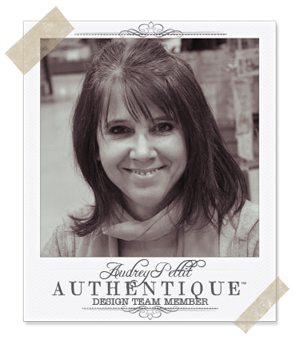 I love the look of Polaroid-style frames, so I added one to my die cut tag base. Stamped the name of the beach onto die cut banners to tuck into the top of the frame, and noted the date up above so that we'll always remember which beach trip these particular shells came from. 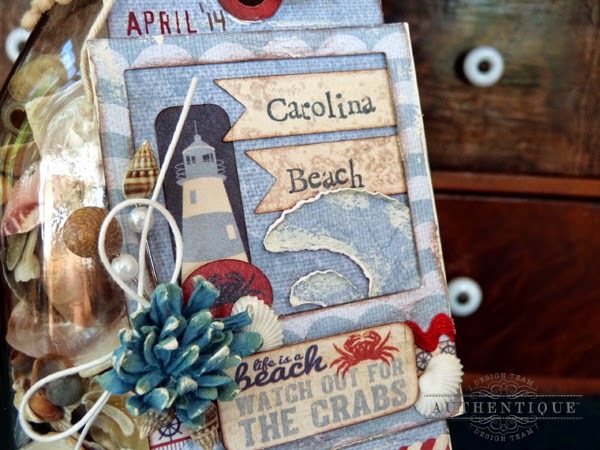 Then I dressed the tag up with lots of fabulous Anchored cardstock stickers and goodies from Petaloo, our product partner here on the blog this week. Petaloo makes all kinds of gorgeous flowers, like this little cutie from the Darjeeling Mini Mix that reminded me of a sea anemone. I was tickled to find that they also have shell embellishments, like the cute designer stick pins and loose shells I scattered around the tag. Now how perfect is that? Petaloo makes pretty trim, too. I added a strip of red ric-rac across the bottom of my frame, along with a fun Details border sticker. Tied the neck of the bottle with taupe mini pom poms, and dressed up the bow with a couple more shell stick pins. The waves I freehand cut from patterned paper, painted, and curled the edges with my fingernail. Then a light dry brush of cream paint over the entire tag for a shabby chic finish. Super cute project. I love your papers the texture is the best to work with. Audrey, what a wonderful way to feature all of those gorgeous seashells! I absolutely ADORE your project. 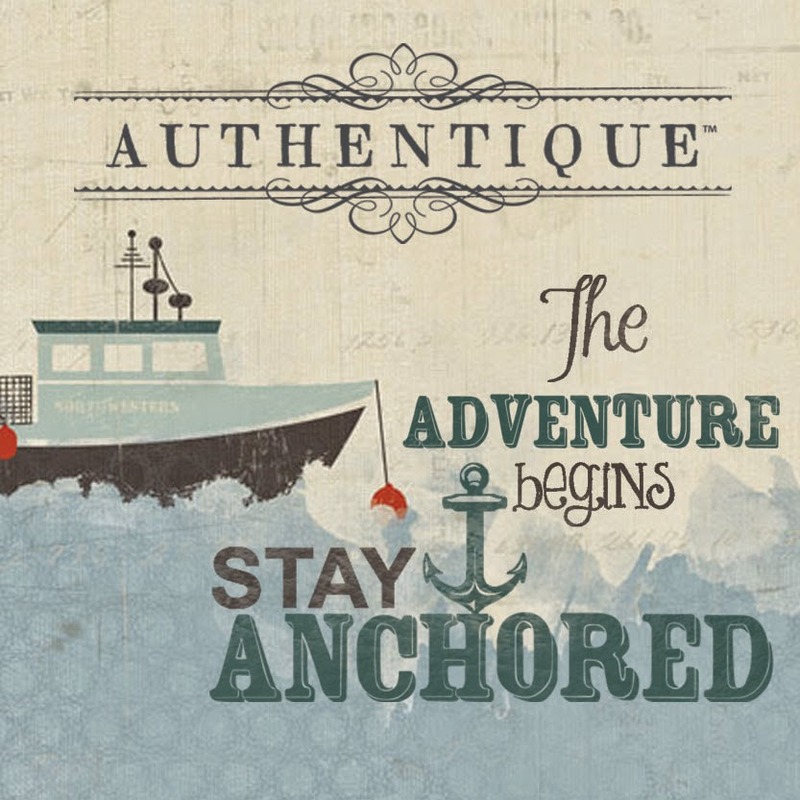 Such a fan of the Anchored collection! The tag is fun and what a great gift idea! Beautiful tag. Love this collection! What a great way to display the sea goodies!!! lovely! Such a cute idea! We also have collections from our trips over the years. What a wonderful way to display them! Gotta give it a try!!! Thanks for the chance to win! Love this collection! Great idea on how to show off those seashells! LOVE that tag really makes the jar special! This is a wonderful collection. Love it!!!!!!! I have a large jar of seashells collected from many places. hadn't thought about decorating it with a tag. Think I'll go look into that right now. thanks for giving me the idea with your beautiful tg. Great project. I'm always looking for different ways to display the shells I collect. Thank you for the inspiration. I am so ready to sail into summer after viewing this fabulous nautical project! I am a summer girl all the way. My favorite pages are from beach trips with my kids and grandkids. I love seashells and your artwork so inspired me I could almost smell the salt air and feel the sand between my toes. After the winter we've all had Summer can not come soon enough. You don't often see flowers on beach scrapbook pages your gorgeous flower is just the right touch. Thank you for sharing this beautiful tag. Thia is a fantastic idea! I'm sure your daughter loves it. I have a granddaughter that loves rocks. I think I'll make something like this for her! She also loves her shoes & wouldn't throw the old ones out, so I took pics of her with her shoes & made an album foe her. She then told mom ok they can go in the trash. She's a funny little girl. Love her so! I love anything to do with the sea and this is such a beautiful way to show off all the shells we all gather when we go to the beach. Must have these papers and of course, all the Petaloo flwoers too! Love the anchor! What a great way to keep all the seashells that you collect on trips. Love this! Would love to make this project with grandchildren this summer! Would love to win the package! THanks!!!! I love the delicacy of the shells in the jar with all the embellishments. Petaloo flowers are the very BEST. Great project. I love this new line of paper, and of course Petaloo flowers are awesome. Thanks for sharing. this would be amazing for my trip to the keys, need to find me some shells. Beautiful! Love this project. A great way to preserve vacation memories. I live right on the Chesapeake Bay, I am always looking for new projects to decorate my beach cottage. I am madly in love with this project and this paper. Please consider me for this prize! the pretty card on it. I love anything nautical, love to collect seashells and other bits and pieces at the beach and love Petaloo. This project is so me. I love it. Lovin this nre paper line! And just in time for beach weather! This is absolutely fantastic!!! I love it! What a pretty Sweet 16 memento you have created for your daughter. She will cherish her gift from her Momma for a long time. Petaloo Flowers are the perfect touch of embellishments, too! What a cute idea! I love the layering on the tag, thanks for sharing. What a fabulous memento for your daughter - love your wonderful tag. What a lovely gift for your daughter! I need to do this with our shells. What a fabulous momento for your daughter! Love it! It's such a great idea and one I am sure she will treasure forever! Love the way you preserved her memories of such a special day. This is so unique and wonderful and will be treasured forever, Thanks for sharing. What a great idea. This will be a very special memory of a great birthday!!!!! What a clever idea to show off all my shells. I have a really old blue glass jar that would work for this. Petaloo and Authentique are 2 of my favorite companies. I would love to win. Love what you did with the shells. The tag is gorgeous. The "Anchored" collection is perfect. This is so very pretty! Just love the combination of two of my favorite companies! Wonderful, love the jar and tag together. Sure your daughter will love this for a long time. I love tags, so pretty! A lovely project. Love the tag. This would look great in any room. I've been saving up seashells for a long time....this is such a great inspiration piece! Love it! A summertime project each and every year...such a great way to preserve memories. I love this project!! Thank you for sharing!! 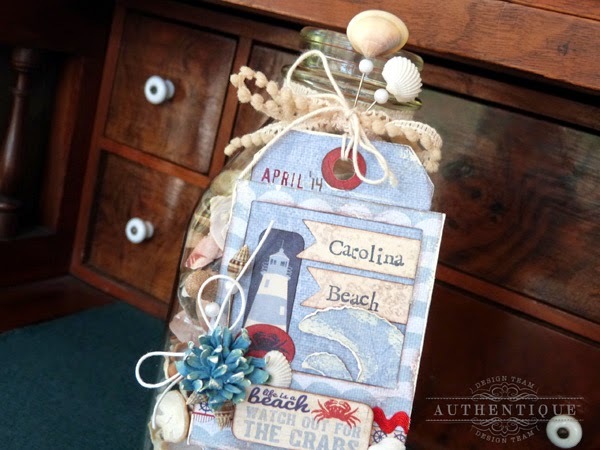 Love the gorgeous tag and bottle of shells! Am really wanting to do this myself! Thanks for the inspiration! Enjoy! I just love the lighthouse. Makes think of our trips to Door County! I have a beach house, so how fun would this be...LOVE it!! Beautiful project & great giveaway! and yesterday's jewelry is BEAUTIFUL!!!!!!!!!!!! 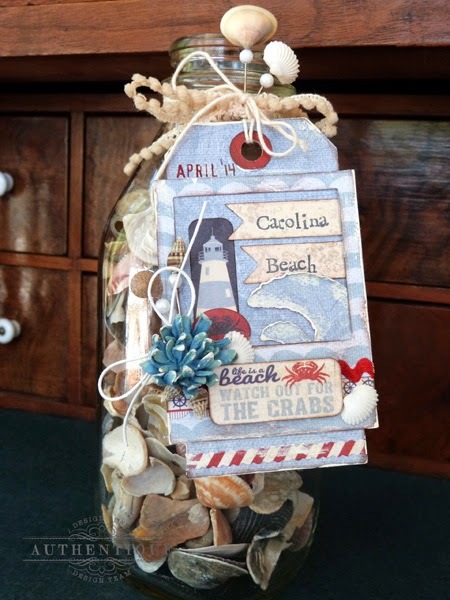 I love the beach so I am totally in love with this project! Love all your products and this is darling! Great idea. You could use this idea for many different kinds of vacation memories! Love the beach, therefore I love all your crafting projects! I love your project! I now know what to do with all the shells I dragged back from Hilton Head, SC! Thanks for the great giveaway! What a beautiful way to store seashells! It brings everyones attention right to them! I love this project. and would be perfect for me and all of my shells. OK, you've got me loving these ideas and wanting this prize pack...hook, line and sinker! A great and creative project using Authentique natuical paper collection. Wow what a wonderful project. Love it and love those papers!! Such a cute idea! What a wonderful momento for the daughter. 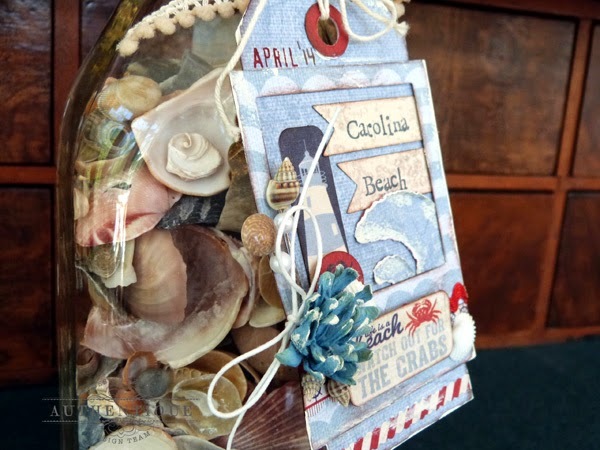 This memory jar really shows off the paper with those natural colors and nautical theme. Gorgeous! Great idea! She will definitely treasure this. Love those Petaloo shell pins too. Thanks for sharing. This project really touches home for me. I have a jar of saved pieces of beach glass that I have collected over the years from the shore close to us. I love the idea of making the tag to explain where they came from. That is really cute and a great idea to put the shells in that bottle. The tag looks super with the polaroid look and the shells here and there on it. What a cool project idea, and a sweet memory keeper for your daughter to cherish. What a cute project! I love the colors! Love the shell project, I could add some of the sea glass I've collected here in Port Angeles, WA. 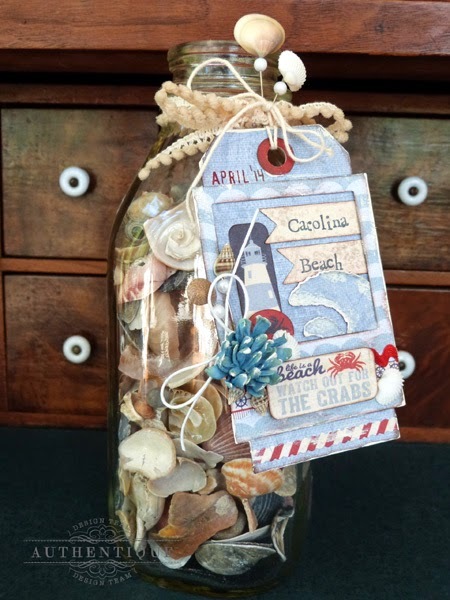 I can't wait to "sail away" with this memory jar for all my "special treasures" I found on the beach this past February. My Hubby and I were "Snowbirds" for the first-time and I have quite a collection and will have a hard time choosing "who" gets in the jar and "who" gets left out!! This is such an original idea! We've collected shells through the years also. They sit in bags in the basement. I'd much rather put them on display like you did.